As you get closer and closer to your baby’s arrival, you’ll start nesting, gathering and preparing everything you think you’ll need for life with a newborn. But if you’re a first-time parent it can be hard knowing exactly what you’ll need to buy. With time ticking down, many parents-to-be go to the nearest supermarket and buy one of everything in the baby aisle! Here’s a list of the top nine essential baby items you need to keep within arm’s reach of your change table. Until you become a mum, you never realise how many uses you’ll find for baby wipes. They’re not just a staple on your change table (and make sure you have multiple packets, it’s not something you want to run out of mid-explosion!) – I also keep packets in my handbag, nappy bag and the back seat of the car. They’re handy for all kinds of wiping emergencies, baby and non-baby related. I only wish I’d discovered them before I became a mum! It sounds obvious, but having a well-stocked nappy supply either under or next to your change table is vital. Parents need to watch babies on change tables at all times, so the nappies need to be within arm’s reach, and preferably in a place you can grab without looking. If you want to save money, buy the market leading brand with maximum comfort and absorption for night time (after a few weeks, your baby likely won’t need nappy changes overnight), and use a low-cost nappy brand during the day, when you’re changing your baby more regularly. My son has always had incredibly sensitive skin and he flares up with a new nappy rash every other day. Sometimes it’s a food or dairy intolerance (though to be honest, most of the time I have no idea why!). You never know when nappy rash will strike, so I have a big tub of barrier cream right next to my nappies, and apply it straight after I wipe him. This helps soothe, heal and protect his delicate skin and creates a barrier against moisture. I use it preventatively and as a treatment for nappy rash. I also keep a smaller tube of it in my nappy bag too, as it’s always handy to have when we’re out and about. My son was a winter baby, born in the height of flu season, and there were many times during those first weeks and months we’d be in his room at 3am, light on and bending over the change table to peer closely at his eyes, nose or throat. He got conjunctivitis a few times and in those middle-of-the-night moments you need saline wipes, which are the medical version of baby wipes. These are perfect for wiping eyes with conjunctivitis (start at the tear duct and gently wipe across the lid). Hanging a mobile above your baby’s change table works for the first few weeks (or months if you’re lucky) but eventually they will attempt to escape each time you lay them down to change the dreaded nappy. The only solution? Distraction. Have a little box of handheld toys or baby-safe household items that they can play with or explore. Things that they can open or close are great. If that fails and they’re attempting another Houdini act, sing them a nursery rhyme or song (it might help to pin some words up on the wall to jog your memory). You know those old-fashioned nappies your mum probably put you in when you were a baby? They’re basically small white squares of terry towelling and are really handy to have for emergencies or to lie under your baby as you change them, to catch any spills. You can even toss one over your shoulder when you’re burping your bub. 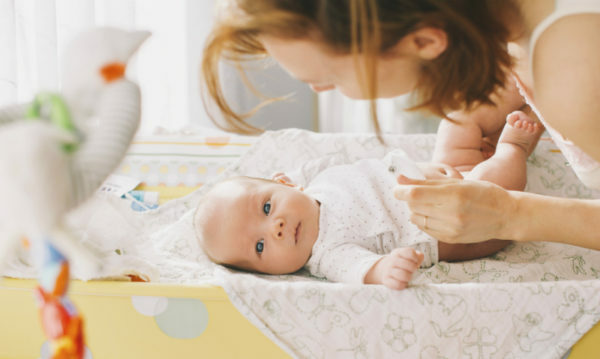 While your baby doesn’t have to have his nails clipped on the change table, keeping them stored in a memorable place is vital. Those clippers have a mind of their own and if you don’t have a spot for them, they will mysteriously disappear right when you need them. On that note, clip your baby’s nails while they’re feeding. The milk makes them sleepy and keeps their hands still. Like wipes and cloth nappies, having a stash of cotton balls within reach is invaluable when you need to wipe a nose, belly button or umbilical cord (which needs to be gently and regularly cleaned in the first five days after birth). You don’t need a whole packet though, just a small jar will do fine. It goes without saying that you need a nappy bin and a whole bunch of plastic bin liners. While I don’t usually buy the fancier and more expensive variation of a perfectly good product, in this case, scented liners make all the difference for disguising odours. You won’t regret it.